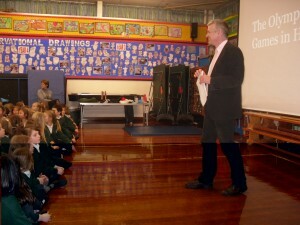 Last week, I gave a talk on Olympic history at Anton Junior School in Andover. The school has done a lot of work on the Olympic Games and the Paralympics, and the staff and students have created some useful educational packs on the subject, so it was great to meet them and share some stories about London’s past Olympic Games. I had two sessions – one with the year 3 and 4 children and their teachers, and one with the year 5 and 6 groups. The highlight for me was meeting such an enthusiastic group, and giving them some perspectives on 2012. The highlight for the children – and the staff – was probably the standing long jump competition that I set up to give them a flavour of what some of the old Olympic sports were like.